I did some things other than ponder death and meaninglessness this weekend. 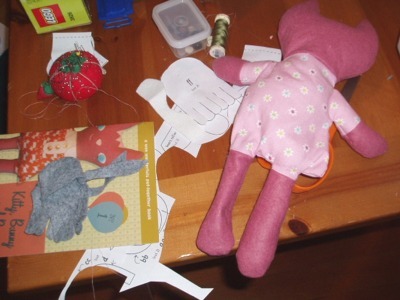 I started a new Wee Wonderfuls doll. I was planning on making the bunny since I made a kitty before but somehow I went on auto-pilot while cutting out the pattern pieces and ended up with the kitty head instead of the bunny. I've got the doll all sewn up as well as her shoes. I just need to finish stuffing, close her up and sew on her face. In other words I still have a lot left to do. I've also started planning my next doll--Spaceboy! I also finally made some semi-reasonable knitting progress this weekend. I finished knitting the legs on my Traveler's Stockings and I turned the heel and completed the gussets on my first Railway Stitch sock. Hopefully by the new year I will be done with all of these socks and ready to move on to something new. And if the sun could come out for maybe twenty minutes I might have a chance to take a photo of these socks so they don't look like dark fuzzy blobs.